Welcome to my website, I hope you enjoy visiting this site. I have been competing in agility since 1988, wow cant believe its been so long! 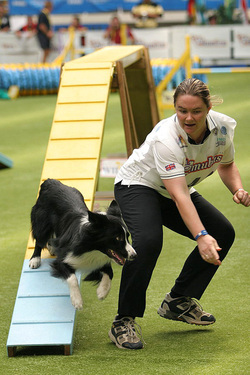 I have enjoyed agility with a variety of dogs from Border Collies, a Rough Collie and a Shetland Sheepdog and thats whats its about enjoying a sport with some great dogs. I have also had a tremendous amount of success representing Great Britain at the FCI WC 10 times with four different dogs, I have also competed at the European Open with Indiana and the IFCS with Indy and Wych. Recently I have just qualified for the WAO with Kayos. Between Indy, Spectre and Mac I have achieved 17 CC and 3 Reserve CC. I also appeared on Blue Peter twice!! I have competed at Crufts for many years since 1990 to the present with 9 different dogs, winning many different events from KCJO (now YKC event), Flyball, large team agility 3 times, Crufts Singles and the Championship event winning those events 3 times in a row.